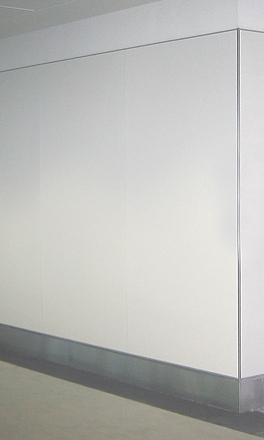 MICAM SlickFit™ is an interior wall cladding system designed for use within BAA buildings that meets the aesthetic appearance, durability and fire performance demands. The elegant contemporary appearance of SlickFit™ provides a finish that falls within the BAA neutral palette and the system provides a highly resilent finish against impact damage. SlickFit™ comprises of a high performance MICAM LSM21 panel and a specially developed frame and fixing system. The product brochure and detailed drawings can be downloaded from the links below.